When it comes to blockbusters, Marvel vs DC stands out as one of the biggest clashes of the last fifteen years. It doesn’t matter if you are a die-hard fan or an occasional viewer, or even if you are not into the genre. From the business point of view, it is interesting to analyse why they get such different financial results, despite offering virtually the same product. Spoilers ahead: good communication strategy and project management make the difference! Over the last twenty years, superhero movies have become an established film genre. Based on this, you would expect that when major film studios get at it, they will experience success and failure in somewhat similar amounts. However, we are seeing that even though all of the Big Eight had their attempt on the genre, only Disney/Marvel Studios has so far achieved an almost untarnished record of financial success, leaving their major competitor DC/Warner Bros far behind. This competition is not only about the fans, but also about the revenue and return on investment. We must keep in mind that the ticket sale is just a part of the pie, there is merchandising, streaming and so on. And it also extends to books, comics, soundtracks and much more. But everything is driven by the box office results. I will not get into the movie review and discuss the quality of the movies, direction or the production. What I will analyse is the marketing strategies, communication and the ability of the studios to deliver. Looking at it from a business perspective, Marvel Studios movies (commonly referred to as MCU) claim five movies on the list of the highest-grossing films of all times. They produced the highest-grossing film of the year 3 times in the last 10 years (when the MCU was launched). Without any exception, all movies are a financial (sometimes even record-breaking) success. The same cannot be said for DC/Warner Bros movies (also known as DCEU). Even though their franchise is younger, it is exploiting an existing superhero movies trend started by the MCU and should be profiting from an existing market. Still, they do not achieve the same financial success. Other studios like Fox, are in an even worse condition, even though there are some significant exceptions. Looking at this picture, it seems that only one studio has the “magic” formula for success. What we can notice from the outside is the difference in the market approach, planning and communication strategy. In short, Marvel and DC do Project Management differently. Selling a good is part delivering quality and part fulfilling expectations. If you are able to brand your product, then you have a major advantage over your competitors. This is exactly what Disney/Marvel did in 2008, and what other competitors, like Warner Bros, are failing to replicate. On communication level, the way Marvel Studios are treating the general audience is nothing less of what we can see in a stakeholders meeting. Plans are announced and dates fixed years in advance. Changes are not hidden, but highlighted and explained, as any good Project Manager would do. Announcing a movie 6-7 years in advance and still be able to deliver, is not only a bold move, it shows that your company is able to plan and deliver according to plans. When it comes to the competitors, things are more confusing. Movies are announced and then cancelled, dates are always shifting. From the marketing point of view, a change in date is not something that should be underestimated. It involves extra cost, and possibly a drop of interest. However, when it comes to customers, incertitude generates mistrust and every failure tends to affect future decisions. Postponing a movie at the last minute and rumours of reshooting might compromise the reputation of the movie before it even sees the light of the day, setting it off to a path of failure. From a project management point of view, this is just bad planning and bad communication. According to Box Office Mojo, the first two weeks tend to be decisive for the overall profitability of a movie. And this is where many movies fail, because if the audience is not “confident” about the product, they may wait it out and see it at home. Bad results in the box office will also lead to low revenues in merchandising and Home video. Considering that the average cost of a night at the cinema is around 80 Euro for a family of four (100 US dollars), we can understand the importance of being convinced about the product we are buying. The viewer needs to be motivated, they need to believe in the product. Disney/Marvel creates the allure of their movies using traditional marketing means as well as innovative techniques (use of post-credits scenes to promote new movies, maximizing the effect of fan conventions by announcing the movies years before the production even starts, using other media to promote and fill the story gaps), but also by conditioning the market. 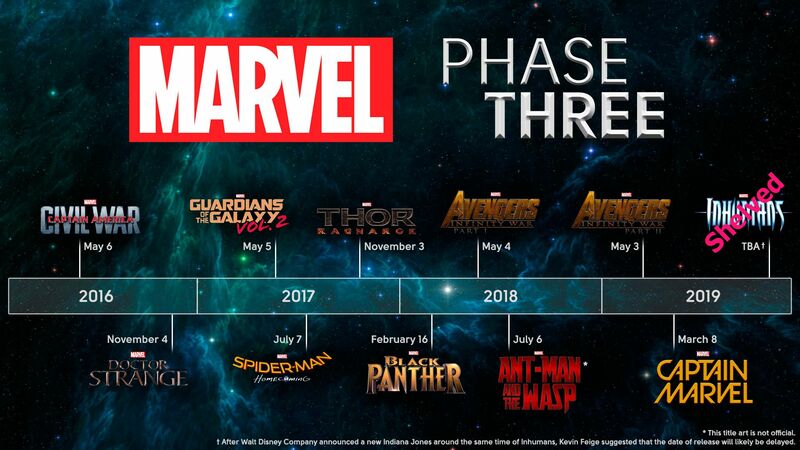 Today, all other studios know the release dates of Marvel movies for the next 5 years and since it is assumed that they will be a success, they have to schedule their dates to avoid the competition with those movies which is a major handicap for them. By doing this, Marvel creates a loop where success creates success and failure is minimized by previous achievements. On the other side, as it happens on many projects, unclear deadlines and continuous rescheduling create the feeling of a low-quality product. This jeopardizes customers trust. Long story short, the real superheroes in the Marvel Universe are actually the Project Managers.